The economy grew 1.6 percent in the October-December period from the previous three months on an annualised and seasonally adjusted basis, the Ministry of Trade and Industry said in a statement today. SINGAPORE (Reuters): Singapore’s economy grew more slowly than forecast in the fourth quarter after the manufacturing sector shrank, adding to jitters that a trade dispute between the United States and China will drag on growth in 2019. Rising trade protectionism and uncertainty over US-China relations are key risks for the city-state this year although the impact from trade frictions have so far had only a limited impact on its small and open economy. Gross domestic product grew 1.6% in the October-December period from the previous three months on an annualised and seasonally adjusted basis, the Ministry of Trade and Industry said in a statement, around half the pace expected by economists. “Most people’s expectation is that we are in for a slow grind for 2019. It would not be out of the realm of this world if we see a continued slower story into the first half of this year,” said Selena Ling, OCBC’s head of treasury research. The economy was forecast to have expanded 3.2% in the fourth quarter from the previous three months, according to six economists in a Reuters poll, and compared with an upwardly revised 3.5% pace in the third quarter. 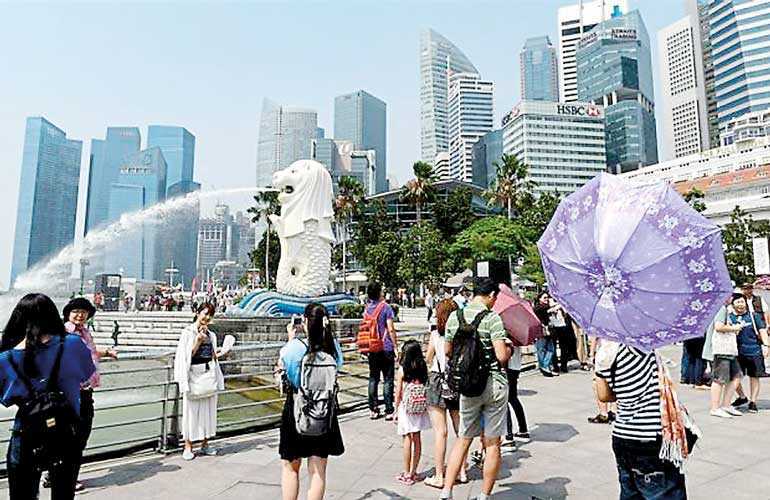 Singapore is considered a bellwether for global growth because international trade – equating to about 200% of its GDP – dwarfs its domestic economy. Manufacturing, which accounts for less than a quarter of GDP, shrank a seasonally adjusted and annualised 8.7% from the third quarter, the first contraction in a year, data showed.Ling said the sector saw a lot of front-loading activities in the run-up to US-China tariffs, after which the rush tailed off and December was also a slower month as shipping of goods for Christmas probably peaked by November.But exporters are already floundering, with November exports down for the first time in eight months year on year and shipments to China, Singapore’s biggest market, continuing their decline. From a year earlier, GDP grew 2.2% in the fourth quarter, slightly slower than 2.3% forecast by economists and a revised 2.3% growth in the third quarter. The trade-reliant economy expanded 3.3% for all of 2018, slowing from a three-year high of 3.6% the prior year. The government’s forecast for 2018 growth had been 3.0 to 3.5%. “I am confident that they will tighten in April because inflation continues to be a big concern,” said Jeff Ng, chief economist at Continuum Economics. The MAS expects core inflation of between 1.5 and 2% in 2018, picking up to 1.5 to 2.5% in 2019. The government has a wide range for 2019’s GDP growth forecast of 1.5 to 3.5%. Separately data on Wednesday showed Singapore’s private home prices fell 0.1% in the fourth quarter, the first drop in six quarters, following a tightening of property curbs.